Last night I tried the SCD Sweet & Sour Chicken recipe from the Relish SCD blog. Which now is called Eat With Your Eyes. I love sweet & sour chicken, but it’s hard to find recipes that do have sugar and cornstarch, so I was happy to find this one. This turned out really good. The sauce is not really a dipping sauce, but cooked with the chicken it works perfectly. 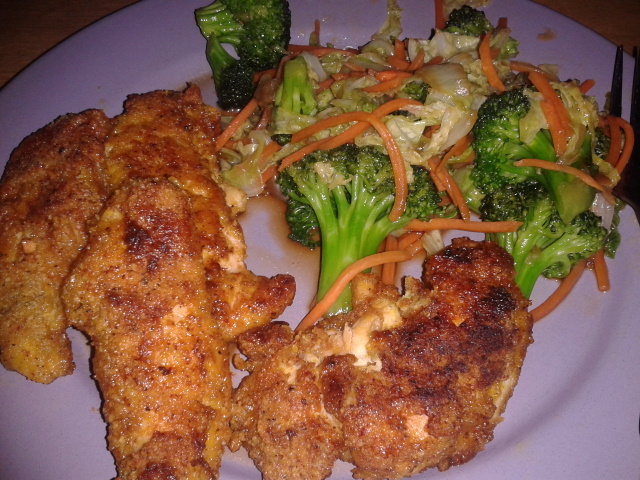 I used my own chicken nuggets recipe, since I prefer almond flour to coconut flour for that. Oh, and I left them as strips instead of cutting the chicken into cubes, but that was just laziness. Their recipe calls for garlic powder, which is generally not SCD legal (unless you can find it without anything added), so I used dried garlic. The sauce was excellent! I highly recommend this recipe. I served mine with some stir-fried Napa cabbage, carrots and broccoli. Wow those look like they turned out awesome! Thanks for reviewing my recipe. That’s a great idea & time saver using strips instead of nuggets!